Manchester Show 2011: iPhone/Android app available for download now | What Hi-Fi? 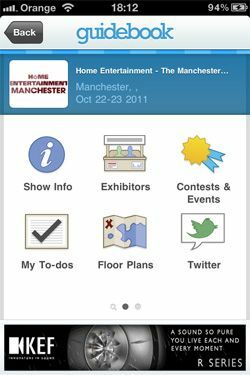 Anyone planning a trip to the Manchester Home Entertainment Show 2011 this coming weekend can now download a free app from the Apple App Store or Android Market. It's compatible with iPhone, Android devices and Windows Phone 7. Click on this link to find out how to get it. The app provides maps of the exhibition, a list of exhibitors, schedules for events, a direct Twitter feed and your own personalised 'To Do' list. If you plan on staying in Manchester, there's also information on local hotels and restaurants, plus details of travel to and parking at the venue. And there are competitions to win a pair of Pioneer headphones, a white Arcam rCube worth £350 or a Quadral Chromium Style 20 2.0 speaker system – see app for further info. For more details of who's showing what at Manchester, see our dedicated blog.